Sue worked with Major League Baseball’s L.A. Dodgers for six years as their head athletic trainer and physical therapist and was the first female head athletic trainer in any of the four major professional sports in the United States. Sue currently is an Associate Professor in Athletic Training at A.T. Still University and sits on the board or serves as an advisor to various organizations such as KinetIQ Global, National Council of Youth Sport Safety, Performance Health, and Meyer PT. With many younger students in high school or college aspiring to work with elite athletes on professional sports teams, we thought we’d reach out to Sue Falsone to provide some insight into her distinguished career and get some advice for others seeking the same path into professional sports. Can you tell us about your athletic background? What sports did you play growing up as a child, in high school, and in college? I was a synchronized swimmer from ages 7-14. I played soccer in high school, but never competed at a high level. I didn’t play anything in college. Basically I spent too much time in the pool when I was younger and didn’t develop great hand-eye coordination or agility skills! What made you decide to pursue physical therapy? Did you always know you wanted to work with the elite athlete population? I originally thought I would go on to be an orthopedic surgeon. But once I got into physical therapy, I realized I loved it. I love the relationships I got to develop with the patients. I realized I didn’t want to do what a surgeon did, and decided to stay with physical therapy. At first I worked with a general orthopedic population and I didn’t enjoy it very much. I then got the chance to work with an athletic trainer who saw a lot of the younger athletes in the post-operative rehab stage. When I saw what she got to do in the clinic, I realized I wanted to do more of that, so I decided to go back to school to get my Athletic Trainer certification. Many student physical therapists aspire to work with professional sports teams. How did you end up at the LA Dodgers? What recommendation would you give for a physical therapy student wanting to work in a professional sports teams, what skills and areas of knowledge to acquire, the reality and challenges of the job, and jobs they might take prior? I was working for Athletes’ Performance (currently EXOS) when the L.A. Dodger’s management came to Athlete’s Performance to seek guidance in creating a systematic solution of prehab, strength and conditioning and nutrition. The project became one I began to oversee. The Dodgers eventually brought on Stan Conte, and he and I collaborated, creating solutions for the organization. With Stan’s guidance, my role with the team grew over time until he asked me if I would take the head Athletic Trainer job after the 2011 season. People graduate from PT school and automatically want to go into sports. But you need to have an unbelievable foundation in orthopedics before you specialize in sports. I think many people see orthopedics and sports medicine as the same thing, but they are very different. Sports med is specialty of orthopedics, so you need a solid understanding there. Create your foundation in orthopedics, neurosciences and movement. Working in a busy orthopedic clinic is very valuable. You learn how to be efficient in your eval skills, you learn how to use support staff to make your time with patients more efficient and effective. You see quantity. You see what a “normal” rehab looks like. It’s important to learn this, so when a rehab is not going “normally,” you recognize that something is off. You also need to spend time with strength coaches. The more you spend time with this group, the more you will understand what it is the athlete needs to get back to after rehab. You will begin to appreciate the value in loading the human body at different loads and speeds. You have to be prepared to work 12 hour days, 7 days a week. You may or may not get a day off in the week. At a professional level, it’s not uncommon to work 7 days a week. Time off is minimal and plenty of personal time is interrupted by work. You need to be prepared for that. Nothing about professional sports is about 8-5 Monday through Friday. As someone who has experience bridging the gap between rehab and performance in the elite athlete population, what do you think is currently missing in terms of professional education? How can professionals from different backgrounds, treating the same athlete, better work together to get better outcomes both in terms of performance and injury prevention? We need to learn to leave our letters at the door. I don’t care if you are a PT, MD, AT, SC…whatever the letters are after your name, leave them at the door. Walk into the room prepared to collaborate and respect other people’s opinions and points of view so solutions can be created in the best interest of the athlete. There is no room for ego. Seek to understand and seek to understand what the other professional is doing and how what you are doing can help bridge the gap between the two goals. 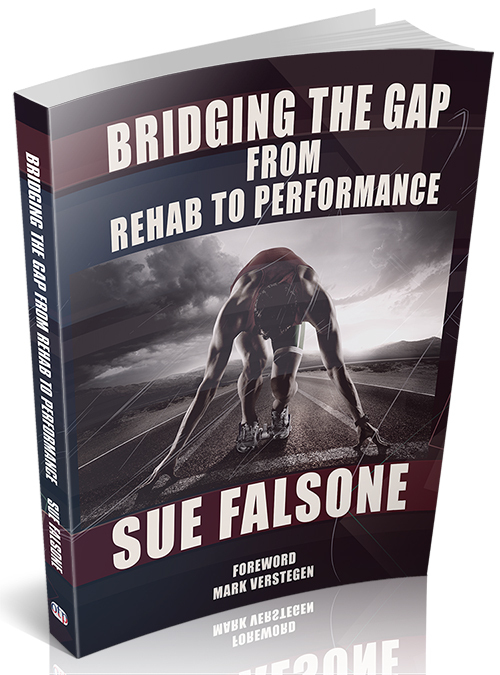 If you are looking to learn from someone who’s worked with elite athletes in professional sports, and want to help ease shoulder aches and pains and help prevent crippling injury, you’ll love Sue Falsone’s Bridging the Gap from Rehab to Performance. Click here to find out more about The Shoulder: Implications for the Overhead Athlete and Beyond and get an exclusive clip from the DVD.